China has become the world’s largest exporter of fur garments in just a few years. Many of the international fur traders, manufacturers, and fashion designers have shifted their business to China, where they can exploit China’s cheap labor and the absence of restrictive animal welfare regulations. China’s new ascendance in the fur market—fur trade production and retail—comes with a heavy price for the fur-bearing animals. China apparently has no laws in place to regulate the confinement and slaughter of the raccoon dogs, foxes, minks, rabbits, and even dogs and cats, whose fur is responsible for a highly profitable industry. While conditions of fur farms in the West have been subjected to criticism by animal rights groups, Chinese fur farms and slaughter methods have been alleged to be far more shocking and brutal. Desperate and writhing in agony, animals conscious during these procedures hopelessly try to defend themselves. China’s fur industry has developed across numerous fur farms over the last 12 years. China’s farms number as many as 10,000, where 90 percent of the skins come from farms with fewer than 50 females, according to the China Leather Industry Association, cited in a report published by Swiss Animal Protection (SAP), Care for the Wild, and East International, (henceforth, called the “SAP report”) in January 2005 and updated last month. Fur farms tend to be concentrated in China’s North East. Fur farms in Shandong province hold the highest number of animals, followed by Heilongjiang province and then Jilin province. Hebei province acts as the hub for the marketing of fur. At the Shangcun Market in Hebei province, 35 million fur skins are traded each year, which accounts for over 60 percent of China’s pelt trade. The above information is taken from Chinese industry sources cited in the SAP report. It was in the Shangcun Market that a 14-minute video was secretly produced in February 2005 by the Swiss Animal Protection SAP which shows the skinning of raccoon dogs, foxes and other animals that are still alive and even struggling (see Animal-Protection.net. WARNING: Images may be disturbing to some viewers). An investigative reporter from the Beijing News observed conditions at the Shangcun Market two months after the video was on the Internet and the report appeared in the online version, April 5, 2005. A spokesperson from the county’s Communist Party Committee propaganda department was quoted as saying that the live skinning took place seven or eight years ago but could not happen now. However, the reporter for the Beijing News confirmed that the skinning alive of most animals at this largest of fur markets in China was still going on, even after it had been exposed earlier. The animals are immobilized by being stunned with repeated blows to the head, or by being slammed on the ground. The animals are injured and may convulse, tremble or attempt to crawl away, says the SAP report—this is also shown repeatedly in the video. The skinning may begin while the animal is conscious or regaining consciousness. Breathing, heart beat…and eyelid movements were evident for 5 to 10 minutes. “Desperate and writhing in agony, animals conscious during these procedures hopelessly try to defend themselves even to the point where all the skin had been forced off …breathing, heart beat…and eyelid movements were evident for 5 to 10 minutes,” describes the SAP report of the video and photos. The International Fur Trade Federation (IFTF), of which China is a member, deplored the SAP report, arguing that it made sweeping generalizations about the conditions in all of China. “It is wrong to portray all fur farming as the same in China,” said the IFTF. Some fur farms are run to western standards, said the IFTF. Conditions will improve for animal welfare in China when fur farmers come to realize that the quality of the pelts improve by employing western standards of animal welfare, and that through education, the situation will correct itself—this is the gist of the IFTF’s response. The fur garments are most commonly sold in the United States, Europe, or Japan as fur-trim on coats, gloves, purses, toys, trinkets, and even furniture. By mixing fur with silk, wool, suede and leather, and employing new manufacturing processes, such as shearing and knitting, and new fashionable colors, fur has attained a new novelty and versatility, according to sources cited in a Care for the Wild International (CWI) report. “Overall, fur was displayed in greater numbers than in previous years, coming in all colors, shapes and sizes,” commented a CNN report on fur’s popularity on runways during New York’s Fashion Week in February 2005. However, consumers may not have noticed the large increase of fur use in fashion today, because fur-trim is much less conspicuous than the expensive full-length fur coats worn in the past, added that most people would be too embarrassed to wear those today. U.S. fur sales in 2003 were $1.8 billion, according to the Fur Information Council of America, cited by CWI. “China has become the leading fur garment exporter to the United States, accounting for 40 percent of total U.S. imports in 2004—the equivalent of $7.9 million,” according to the SAP report. However, exact import statistics are difficult to obtain because fur trimmings are not specifically declared to customs, says the SAP report. The Anti-Fur Society of Washington, D.C.—a member of the International Anti-Fur Coalition—disapproves of the cramped wire cages that leave almost no room for the animal to move about. In these cramped quarters, the animals show signs of extreme anxiety and pathological behaviors, according to a report by CWI. The Anti-Fur Society of Washington, D.C. especially objects to the slaughter methods, including the skinning of the animals alive, “which makes China’s fur industry the most barbaric in the world,” says their press release. Their membership find these practices highly disturbing and horrifying. Chinese suppliers offered us entire sheets made of dozens and dozens of cat skins. A UK-based charity, Care for the Wild International (CWI), reported that on Nov 20, 2006, the E.U. banned imports of pelts of dogs and cats. 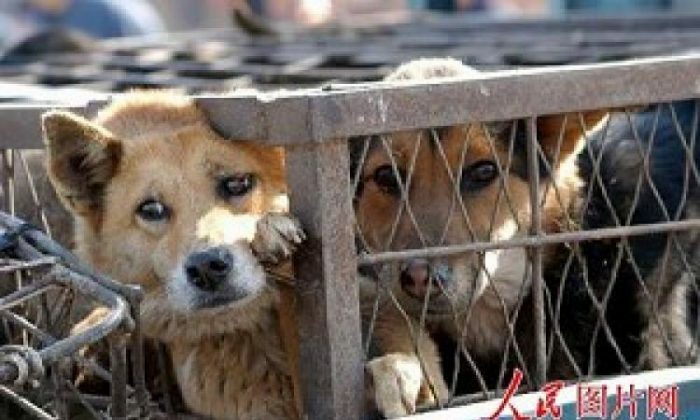 The CWI stated that 5,400 dogs and cats are slaughtered every day in China. “Chinese suppliers offered us entire sheets made of dozens and dozens of cat skins—all in matching color patterns of tabby, ginger, black and white or tabby and white,” says Dr. Barbara Maas, CWI’s chief executive. To protest China’s alleged inhumane methods for fur industry animals, members of the Anti-Fur Society of Washington, D.C. on February 13 carried a symbolic casket across the Taft Memorial Bridge, followed by a funeral for the animal victims of the Chinese fur trade in front of the Chinese Embassy at 2300 Connecticut Ave. This demonstration at the Chinese Embassy was one of many that occurred on the same day in over 35 cities worldwide. The documentary of the gruesome slaughter methods in the Shangcun Market made by the Swiss Animal Protection is often mentioned by the protesters as graphic proof of the barbarity of China’s fur industry. In Switzerland and several European countries, fur farming has been banned due to considerations for the humane treatment of animals. “In their lives and their unspeakable deaths, these animals have been denied the simplest acts of kindness,” writes the investigator of the SAP report on conditions of the Chinese fur farms. Global fur sales in 2005 totaled $12.8 billion, which was a 9.1 percent increase from 2004, according to the International Fur Trade Federation (IFTF). In 1999, sales were only 8.2 billion and have been rising steadily every year for the last six years. To get some idea of China’s relative place in the industry, in world-trade mink production China takes up 22.4 percent of the total, which places it behind first place Denmark with 30.3 percent of the mink production in 2005. Sandy Parker estimates 10 million mink pelts produced in China in 2006, up 25 percent from 2005. Also, China has become the world’s leading exporter of fox and raccoon dog pelts, according to the Sandy Parker Report. Howard Zinn wants history to be experiential, real, and relevant; hence, "The People Speak," his new documentary.